Driving west from Cedar Park on FM 1431 toward Lago Vista, you plunge down steep grades and charge uphill around curves surrounded by oak and juniper forest. Breath starts to come easier, relief from the stress of traffic. 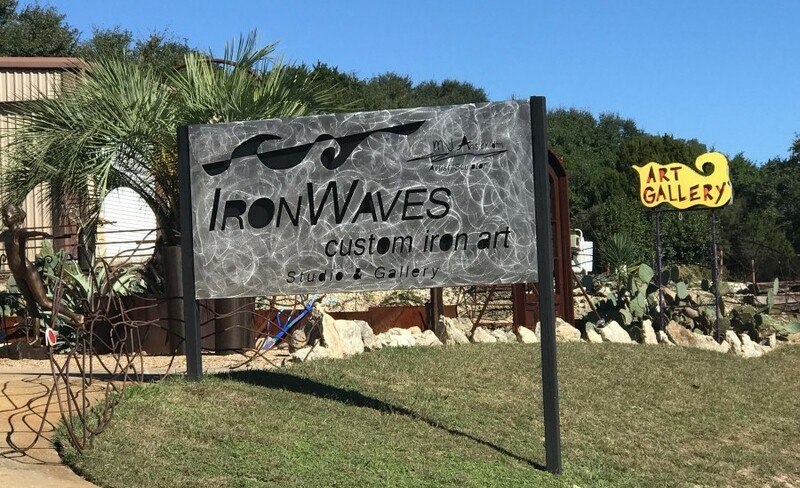 Slow down and pull over after cresting the hill into Jonestown for another visual treat—IronWaves Custom Iron Art Studio & Gallery at 18658 FM 1431. “This is the most beautiful area around Austin,” says Mark Ansier, an internationally known artist and the owner of IronWaves, where he creates his beloved marine sculpture. He also designs and produces everything from furniture to architectural masterpieces: doors, gates, railings, commercial interiors, fire features, and signage. “Anything I can get my artistic teeth into,” Ansier says. His work enhances and echoes the Hill Country’s natural beauty. Facing the street, an arched double door leads visually into a cactus garden made of oxide-rich metal. Decomposed granite crunches under your feet, and at each turn there’s a new wonder. Whimsical brightly painted trees and a life-size bronze ballerina balance oxidized metal planters, fireboxes, a gravity-defying tower of rings, and tiki torches made of wine bottles. Even the exterior walls of the gallery are art. Much of the siding is reclaimed metal sheets, their variegated patinas each telling a story. Functional pieces—entry doors, lamps and light fixtures, firescreens, and a surprisingly comfortable bench—share space with decorative ceramic rabbits, musical notes, and breathtaking renderings in metal of dolphin, sailfish, and stingrays. The sailfish is modeled after one caught by Ansier’s daughter, Cally, on a fishing trip; Mr. Harvey the shark sculpture is one Ansier will never sell. Some of the sculptures and paintings are signed MJ Ansier dtm. Others are created by local talents like glass artist Jack Degenhart-McCoy and sculptor Cindy DeBold. It hasn’t happened without trouble. On May 21, 2016, a couple called in to report flames they saw shooting out of IronWaves. Still, the gallery was months in rebuilding. Soot and smoke are acidic and attacked the metal pieces. Repairing and saving them from further damage took top priority. The shark sculpture was among the pieces that needed attention. Ansier appreciates the concern people showed after the fire. Clients from all over the world called to see if he was okay. Those who live closer would even come over: “They’d give me a hug, ask if they could help.” And they were patient, willing to wait as long as it takes for each one-of-a-kind commission. We can thank Jacques Cousteau for inspiring Ansier’s childhood love of the ocean. Scuba diving everywhere he could upon reaching adulthood, Ansier even became a dive instructor. Diving, in turn, sparked his ideas for creating marine art in metal. This year he’s building a major monument sculpture on the Caribbean island of Bonaire, a neighbor of Aruba and Curacao. The island paradise is where he and his wife Jennifer plan to live at least part-time some day. Ansier says the monument is bringing him full circle: “Art, diving, now diving art.” Using expertise gained from his recycling business, Ansier convinced island officials of his vision. As Bonaire is a diving destination, a scuba diver will be at the monument’s center. Ansier has a very specific diver in mind: his son, Matt, who graduated from Leander High School in 2006. The Bonaire monument is not the only sculpture Ansier has made from recycled materials. Chef Taylor Hall of the Apis Restaurant and Apiary in Spicewood wanted to know if Ansier could fashion a giant beehive chandelier out of barbed wire. Employing his “healthy disregard for the impossible”—a personal motto—Ansier agreed, though he had no idea how. He figured he’d be bleeding before it was done. Ansier also created a sculpture for Lago Vista’s La Primavera bike race in about a day, when organizers approached him just ten days before the race was scheduled. Since time was tight, Ansier asked the organizers to get him old bikes. After pondering their shapes for days, he fused them into a stunning tower of movement, air, and grace. IronWaves is a design studio that enables designers, builders, and private clients to interact. Here, they can clearly envision unique pieces and bring them to life with the help of masters. Ansier doesn’t create all this art by himself, especially the big technical pieces. He has four regular employees and eight to ten others he can call on. “I’m no welder,” Ansier admits. But he points out that his future partner in the business, Justin Corbin, is a highly skilled machinist and welder. As we talk, Corbin grinds a piece of metal smooth, then flips a switch to turn on the TIG welder and lowers the shade on his helmet. Sparks fly, and moments later a tiny sculpture sits on the table next to him. The smell of hot metal is subtle, like a teakettle left to boil dry. Just east of Bagdad and west of 183 on highway 1431, a three-story cross towers above the Good Shepherd Lutheran Church. Ansier designed and built it in his Jonestown studio. Although he’s not a regular churchgoer, this cross has special meaning to the artist. It’s clear that the artist puts his heart into every piece. But there are pieces that hold sway over his heart, too. That shark sculpture on the wall behind him is one that he started with his son Matt’s help—the reason it will never be sold.